Zoledronic acid (ZA), a potent osteoclast inhibitor, induces apoptosis in osteoclasts by inhibiting enzymes of the mevalonate pathway and preventing the isoprenylation of small GTP-binding proteins such as Ras and Rho. Quantification (C) of SA-β-gal+ SMCs after sustained 100nM ADP treatment for 48hr with or without Ras inhibitor zoledronic acid (ZA) (n=4 in each group). #p<0.05, ##p<0.01 compared with control, *p<0.05 compared with P2ry12+/+ADP. (D) Incidence of TAAD formation and rupture after BAPN administration with or without ZA. (E) Elastin degradation grades of mice aortas after BAPN administration with or without ZA. (F) Representative H&E staining of thoracic aorta and progression of thoracic aorta diameter of mice aortas after BAPN administration with or without ZA (n=8 in both group). (G) Representative images and quantification of SA-β-gal (blue) staining in mouse aorta after BAPN administration with or without ZA (n=4 in both group); arrow, location of SA-β-gal+ area. (H) Immunostaining and quantification of p-ERK and p-p38 in mouse aorta with or without ZA (n=4 in both group). Data are meanSD from three experiments. *p<0.05, compared with no ZA. NSC 23766 is an inhibitor of Rac GTPase targeting Rac activation by guanine nucleotide exchange factors (GEFs) with IC50 of ~50 μM in a cell-free assay; does not inhibit the closely related targets, Cdc42 or RhoA. MES cells were treated with Rac inhibitor (50 μM EHT1864 or NSC23766) and assayed for self-renewal by serial passage mammosphere formation. P1, passage 1; P2, passage 2. Data are means ± SEM of three biological replicates. *P ≤ 0.05 by two-tailed t test. EHop-016 is a specific Rac GTPase inhibitor with IC50 of 1.1 μM for Rac1 in MDA-MB-435 and MDA-MB-231 cells, equally potent inhibition for Rac3. Human HCT116 cells were treated with conditioned media of (LPS + Chol)-treated THP-Ms or IL-1b (10 ng/ml) in the absence or presence of Ehop-016 (10 μM), and effects of the indicated factors on b-catenin transcriptional activity of HCT116 cells were determined by the TOP and FOP flash reporter assay, and the protein levels of GTP-Rac1, total Rac1, p-GSK3b (S9), total GSK3b, PCNA and Cyclin D1 were analyzed by western blot (H). ZCL278 is a selective Cdc42 GTPase inhibitor with Kd of 11.4 μM. Rho GTPases were involved in NaAsO2 induced apoptosis in rat CGNs. A. Representative fluorescence images of cells exposed to 0 and 10 μM NaAsO2 for 24 h with or without ZCL278 (an inhibitor of Cdc42), or a Rac1 inhibitor NSC23766. Both ZCL278 and NSC23766 reduced the apoptotic cells. B. The graph indicates TUNEL-positive rat CGNs exposed to NaAsO2 (10 μM) with ZCL278 or NSC23766 groups decreased significantly compared with those of NaAsO2 treatment group. Data are expressed as mean ± SD from at least 5 visual fields. C. Rat CGNs in 96-well plates were treated by 0 and 10 μM NaAsO2 for 24h with or without ZCL278 (an inhibitor of Cdc42) pretreatment for 1 h, or a Rac1 inhibitor NSC23766 pretreatment for 12 h, and assessed by a CCK-8. ZCL278 and NSC23766 increased rat CGNs viability exposed to NaAsO2. All statistical results are expressed as means±SD from at least three independent experiments. ***P<0.001 vs control, # P<0.05, ##P<0.01, ###P<0.001 VS NaAsO2 treatment group. 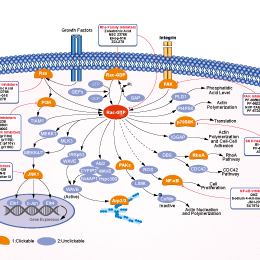 MBQ-167 is a potent and dual inhibitor of Rac and Cdc42 with IC50s of 103 nM and 78 nM respectively, in metastatic breast cancer cells. Zoledronic acid, a nitrogen-containing bisphosphonate, is a potent osteoclast inhibitor which induces apoptosis in osteoclasts by inhibiting enzymes of the mevalonate pathway and preventing the isoprenylation of small GTP-binding proteins such as Ras and Rho. Salirasib is a potent competitive prenylated protein methyltransferase (PPMTase) inhibitor with Ki of 2.6 μM, which inhibits Ras methylation. Phase 2. Cells were treated with CCG-1423 for 48 h. CCG-1423 blocked the nuclear translocation of MRTF-A. CCG-203971 is a novel small-molecule inhibitor of the Rho/MRTF/SRF pathway with the IC50 value of 0.64 μM for SRE.L. It inhibits Rho-mediated gene transcription. (A) Proliferation of Calu-1 cells after SAHA and K-ras inhibitor (K-ras C12) treatment. Calu-1 cells, containing an activating G12C K-ras mutation, were treated with SAHA (2.5 mM) and K-ras C12 (10 mM) for 24 h and analyzed as in Figure ​Figure1A.1A. (B) Immunoblotting of Calu-1 cells treated with inhibitors. Cells were treated with inhibitors as indicated for 24 hrs. Cell lysates were collected and immunoblotted with antibodies indicated. Kobe0065 is H-Ras-cRaf1 interaction inhibitor, exhibiting potent activity to competitively inhibit the binding of H-Ras·GTP to c-Raf-1 RBD with a Ki value of 46 ± 13 μM. K-Ras(G12C) inhibitor 6 is an allosteric, and selective inhibitor of oncogenic K-Ras(G12C). KRpep-2d is a K-Ras(G12D) selective inhibitory cyclic peptide with selectivity against wild-type (WT) K-Ras and the K-Ras(G12C) mutant. The IC50 value is 1.6 nM. ARS-853 is a selective, covalent KRAS(G12C) inhibitor that inhibits mutant KRAS-driven signaling by binding to the GDP-bound oncoprotein and preventing activation. EHT 1864 2HCl is a potent Rac family GTPase inhibitor with Kd of 40 nM, 50 nM, 60 nM and 250 nM for Rac1, Rac1b, Rac2 and Rac3, respectively. Inhibition of Rac1 activity by EHT 1864 blocks alignment under flow, whereas solvent control-treated ECs aligned in the direction of flow. Note that the inhibitor was present throughout the experiment, due to the closed system that is used for long-term flow experiments. Bar graph on the right shows percentage of aligned cells in under static and flow conditions for both EHT 1864-treated and solvent-treated Ctrl ECs. ECs orientated between a 0-45° angle are quantified as being aligned. Data are mean of three independent experiments ± SEM. ***P<0.001. Bar, 25μm. (A) The survival rate detected at 72 h after the injection of different concentrations of ML141; shrimp injected with DMSO were used as controls. (B) The expression of WSSV IE1 at the mRNA level at 24 h post ML141 injection. Shrimp injected with the same amount of DMSO in each group were used as controls.